experience a Disney•Pixar favorite like never before when A Bug’s Life wiggles and squirms onto Disney Blu-ray Hi-Def on May 19, 2009! For the first time ever, this blockbuster hit will be presented in the pristine manner intended by the Pixar animation team – with glorious high definition picture and sound that’ll make this animated classic a truly magical experience for all. 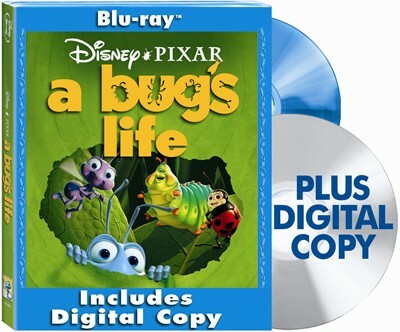 In addition, this new Blu-ray edition comes packed with several new bonus features, a DisneyFile Digital Copy of the movie and access to all avatars and a trivia game via the Disney’s BD-Live Network This May, make A Bug’s Life part of your life for an epic adventure of miniature proportions – now in amazing Blu-ray Hi-Def! BLU-RAY: The film is presented in 1080P widescreen in a 2.35:1 aspect ration preserving its theatrical format. The picture is just flawless, bringing to perfection the colorful animation of the film. It doesn't look like this film was released 11 years ago. Not only the picture looks great in this release, also the sound it is good, a 5.1 DTS-HD Master Audio (48kHz/24bit) that provides a good complement to the picture. The little insect's sounds are as real as it can be. Very impressive sound. Like always Walt Disney Home Entertainment has done it again with this release. In terms of Special Features, the A Bug's Life's two disc Blu-ray includes all the original DVD features plus all-new featurettes, which includes a special introduction from director John Lasseter (Cars, Toy Story), plus exciting new bonus material designed exclusively for the Blu-ray release, including the “Filmmakers Round Table” feature, in which the creative minds behind the movie discuss Life’s journey from story to screen. Plus, see the animation process from the beginning stages in the WDSHE – A Bug’s Life BD, feature “A Bug’s Life: The First Draft” (also including a special introduction by director John Lasseter). Another new feature in this release is DB-Live, which allow users to get exclusive online content, users get opportunity to chat, participate in movie challenges and access movie mail. Your Blu-ray player will need to be connected to the internet, in order to access this features. This release also includes DisneyFile Digital Copy, which enables A Bug’s Life Blu-ray owners to receive a digital version of the movie in their choice of iTunes or Windows Media formats. DisneyFile Digital Copy is a fast and easy way to enjoy your favorite Disney movies, anytime, anywhere on your Mac, PC and/or compatible portable device. Overall this is a release that should be in your Disney collection. Filmmakers Round Table: Filmmakers John Lasseter, Kevin Reher, Darla Anderson and Andrew Stanton take a journey back 10 years from when the theatrical release first premiered and discuss what advances Pixar has made in technology, story telling and the overall filmmaking process. A Bug's Life : The First Draft: Existing storyboards from Pixar’s original story treatment brought to life by animating them.